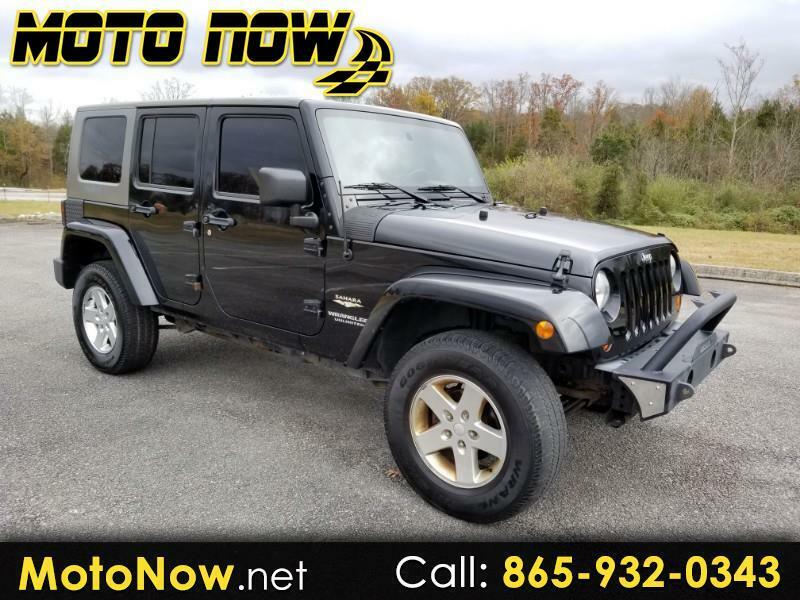 *** AT OUR SEVIERVILLE LOCATION *** The Jeep Wrangler is something like a Harley-Davidson. It's an anachronism, and should probably be a dinosaur, but no, it's still popular because it fills a need like no other vehicle. Despite its inherent design limitations (we won't call them flaws), primarily balance and storage, the Wrangler delivers inimitable fun. Challengers have not been able to steal from the allure of the Jeep. The dynasty lives on. Jeep engineers have kept the momentum rolling by making timely improvements. Model year 2007 brings an all-new Jeep Wrangler that (no surprise) looks just like the old Jeep, whatever 'old' Jeep you might be talking about. Can you name one vehicle (besides the Harley) that has changed its looks less, in 60 years? In 2007, Jeep introduces its first four-door, using the name Unlimited from last year's stretched two-door. You might wonder what took them so long. It's a perfect fit for the times. It doesn't change or pervert the character of Wrangler at all, it just makes the vehicle more attainable, and more desirable for many. It's much more comfortable and convenient, and holds way more stuff, including happy passengers. Maybe best of all, a lot more content has been added, especially in the areas of comfort, safety and convenience; and there has been an average price reduction of $1200 down the line. Each of the six models of the Wrangler uses the same new engine, a 3.8-liter V6 making 12 more horsepower than the previous trusty inline-6 that's been around for more than 20 years. It has the same peak torque but at a higher range, and that detracts some from the Wrangler's uphill performance; but gas mileage is about the same, at 16 city and 19 highway for the 4x4. The standard transmission is a six-speed manual, which fits the Wrangler's personality quite well; the optional four-speed automatic overdrive is for those who appreciate convenience more than aesthetics. The all-new 2007 Jeep Wrangler is available as the Wrangler X, Sahara and Rubicon. The four-door Wrangler Unlimited also comes as an X, Sahara or Rubicon. All come with the new 3.8-liter V6 engine with 198 horsepower, the six-speed manual transmission and four-wheel disc brakes with ABS. A four-speed automatic transmission ($825) is optional. The Wrangler X ($18,105) comes with the basic soft top, theft deterrent system, 16-inch steel wheels, rear folding seat, locking glove box, 12-volt auxiliary power outlet, tilt steering wheel, and six-speaker sound system with MP3 input. Options include the versatile Sunrider soft top ($250), a new three-piece modular hard top ($945), air conditioning, Sirius Satellite Radio, six-disc DVD player with MP3 outlet, 368-watt Infinity sound system, remote entry and power locks and windows, and, for the first time in a Wrangler, power windows and locks with remote entry. There are also a Dana 44 rear axle, Trak-Lok anti-spin differential, 16- or 17-inch aluminum wheels, electronic front sway bar disconnect, trailer tow group, tow hooks, engine block heater, and locking fuel filler cap. The Sahara ($19,345) is the premium model in the lineup, and adds the Sunrider top, the electronic stability program, electronic roll mitigation, 17-inch aluminum wheels with Goodyear Wrangler tires, body-colored fender flares, tubular side steps, heavy-duty suspension, tinted windows, cruise control, foglamps, tow hooks, and the Infinity sound system. Options include all the X options, 18-inch aluminum wheels, and an infotainment system with navigation, using a 20-gigabyte hard drive and DVD video-audio capability of storing 150 hours of music or probably a zillion photos. The Rubicon ($26,090) is the model for serious off-roading. To the Sahara, it adds the disconnecting front sway bar, Rock-Trac part-time transfer case with 4:1 low range, Dana 44 front and rear axles, Tru-lok locking front and rear differential, 4.10 axle ratio, rock rails, and 32-inch B.F.Goodrich Mud Terrain tires on 17-inch aluminum rims. The four-door Unlimited X comes with either two-wheel drive ($19,750) or four-wheel drive ($21,750). Standard equipment includes all that the two-door X offers, plus a Dana 44 rear axle, 23-gallon fuel tank, air conditioning, 60/40 split rear seat, full-length floor console and colored fender flares. It offers all the options as the two-door X and two-door Sahara, plus seat-mounted side air bags. The Unlimited Sahara two-wheel drive ($24,075) and four-wheel drive ($26,075) is equipped like the two-door Sahara, except its power doors and windows are standard.